Pink variety: Dipladenia Sanderi (aka Mandevilla sanderi) Originally from the hills above Rio de Janeiro, but apparently no longer found in its native habitat. Known for its showy flowers, the genus Mandevilla includes plants that were formerly called Dipladenia. There are about 100 species of this tropical American woody vine. Most species overwinter only in the tropical South. In South Carolina they can be treated as annuals or grown indoors. They can be brought indoors before the first freeze and treated as a houseplant during the winter months. In the spring, mandevilla can be returned outside after the last spring freeze or after the threat of freezing weather has passed. Mandevilla is great trellised in containers or in hanging baskets. Quantities of fragrant flowers compensate for sparse foliage and for the care mandevillas require. The flowers are produced in early summer and again in early fall, even when plants are very young. Indoors, mandevillas need curtain-filtered or bright indirect sunlight. Provide night temperatures of 60 to 65 ° F and day temperatures above 70 ° F. Plant in a mixture of equal parts peat moss, potting mix and builder�s sand. In spring and summer, feed every two weeks with a fertilizer high in phosphorus such as 10-20-10. Outdoors, grow mandevillas in partial shade. They need rich, well-drained, sandy soil with humus added. Provide a frame, trellis or stake for support. Pinch young plants to induce bushiness. Since 45 to 50 ° F is the minimum temperature that can be tolerated by mandevilla, plants should be moved indoors for the winter. Before bringing them indoors, examine them carefully for pests. Look under the leaves, in the leaf axils, and in every conceivable nook and cranny for insects and their eggs. Remove any diseased or dead leaves by hand. Insect-infested plants can be doused with a forceful spray of water to dislodge the pests, or you can use insecticidal soaps or other appropriate insecticides labelled for use on your plant. You may have to prune some of the plant to compensate for any root loss. Move the plants to a well-lit location where the temperature is above 45 to 50 ° F. Reduce the frequency of watering to coincide with the plants� rest periods induced by the cooler temperatures and reduced light. In late winter or early spring before growth begins, prune by removing old, crowded stems and shortening others. Even if mandevilla is pruned almost to the ground, it will bloom the same summer on the new shoots, which develop from the base of the plants. Mandevilla �Alice du Pont� is a woody, twining evergreen vine. It grows to a height of 20 feet but is much shorter when grown in a container. The leaves are dark green, glossy, oval and 3 to 8 inches long. Clusters of pure pink, flared, trumpet-shaped, 2- to 4- inch flowers appear among the leaves, spring through fall. Even very small plants in 4-inch pots will bloom. This cultivar grows well in hanging baskets. Pinch off tips of new stems to induce dense growth. 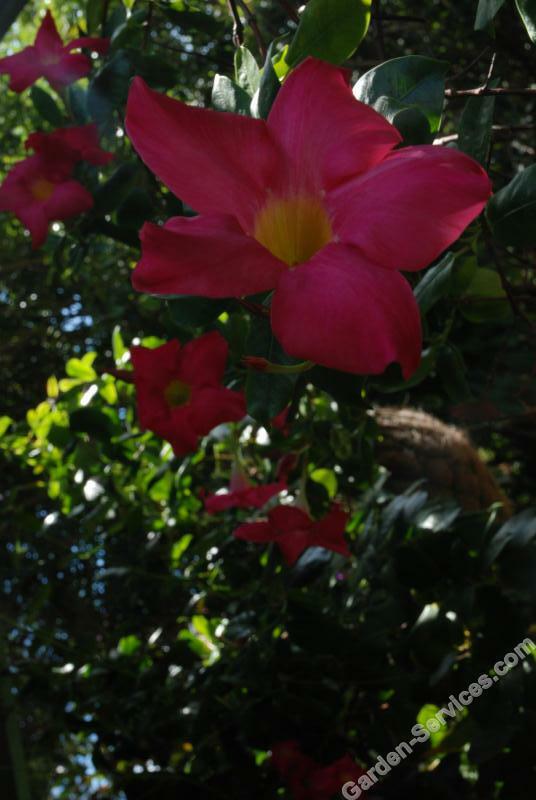 Mandevilla �Laxa� or Chilean jasmine (although it is native to Argentina) is a climbing, woody, deciduous vine. It grows to 15 feet. Leaves are opposite, oblong or heart-shaped at the base. They are 2 to 6 inches long, thin and dark green with gray-green undersides. Clustered summer flowers are white, 2 inches across and trumpet-shaped with a powerful gardenia-like fragrance. Provide rich soil. If the plant becomes badly tangled, cut it to the ground in winter. It will bloom on the new growth. Roots are hardy to about 5 ° F.
Mandevilla �Splendens� is an evergreen similar to �Alice du Pont�, with the same bloom period. The leaves are narrow, pointed and 3 to 8 inches long. The trumpet-shaped flowers are 2 to 4 inches across, pale pink when they open, with rose-pink eyes. As the flowers age, their color deepens to rose. The stems of M. �Splendens� reach 10 to 15 feet in length. �Red Riding Hood� has deep red flowers. �Summer Snow� has sparkling white 3- to 4- inch flowers against dark glossy foliage. �Yellow� has wide, bright yellow flowers. They are lower growing and shrubbier than the species and superb in hanging baskets. The most common pests are mealybugs, scales, whiteflies and red spider mites. Prepared by Marjan Kluepfel, HGIC Information Specialist, and Bob Polomski, Extension Consumer Horticulturist, Clemson University.